I think the author of the Guardian article here about Jeremy Brett as the iconic Sherlock Holmes touches on a lovely point that we imprint ont he Sherlock Holmes we’re first exposed to in childhood. I particularly like how the author connects Sherlock Holmes with those other iconic fictional characters that have been played by many people, the Doctor of Dr. Who and James Bond. Given that Dr. Who is celebrating it’s 50th Anniversary next year and the current connection between it and the BBC Sherlock, I think this is point to keep in mind (especially since the U.S. will be introducing a New York based Sherlock with a female Kato Watson next season). Anyway, Jeremy Brett will always be the definitive classic Sherlock Holmes for me (just as Joan Hickson will be the definitive Miss Marple and David Suchet the definitive Poirot). And as soon as I get even a little caught-up, I plan to drag out my DVDs and watch the series again. 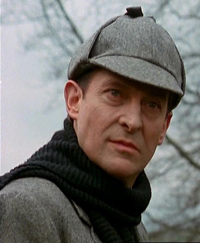 This entry was posted in Other and tagged article, jeremy brett, Sherlock Holmes, tv series on May 14, 2012 by JH Watson. Ah, a kindred spirit regarding all three detectives. I have yet to see anyone come close to the performances of these three.